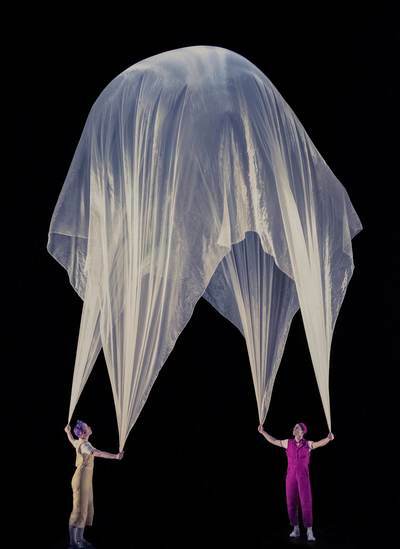 Air Play, an act by world-famous clowning duo the Acrobuffos, opened at the Arts Centre Melbourne yesterday, and what a beautiful crowd pleaser it was. Performed by two New Yorkers Seth Bloom and Christina Gelsone, Air Play proves that a show without dialogue nor extravagant costume, can still wow an audience from beginning to end. 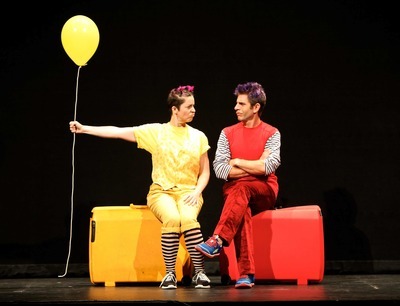 Air Play's comical duo, one dressed in red, the other yellow, consistently intrigue the audience with the goodies pulled from their respective coloured suitcases. What gives Air Play it's name, is the way the duo use props to create the most spectacular air borne scenes. 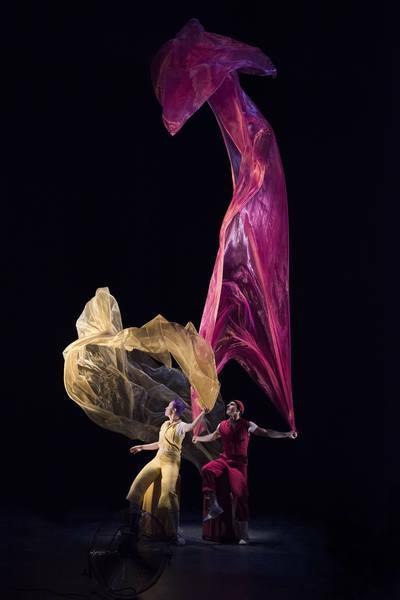 Seth and Christina manipulate the air whirling around the stage using huge sheets of sheer fabric, balloons big and small, umbrellas, a touch of glitter and sprinkling of confetti, to create striking sculptures, which reach high up into the ceiling of the State Theatre. 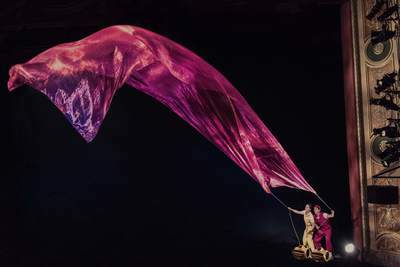 Not only is Air Play an eye catching spectacle, but the hour performance is emotionally charged, taking audience members on a beautiful journey using a fabulous soundtrack of upbeat and downbeat tracks to represent each scene. Expect plenty of laugh-out-loud moments, a little audience participation, and plenty of awe-inspiring visuals to feast your eyes over. Air Play is a charming performance, and would easily please the youngest audience members through to the young-at-heart. Our own Mr.3 sat mesmerised (and commentated!) throughout, and Mr.8 found the balloon antics simply hilarious. You've only got until the 22nd January to see Air Play, so book your tickets quick-sticks before the clowning duo fly back to New York City.